What defines me as a person is being a proud Latina. Growing up in a bilingual bi-cultural environment in Los Angeles made me have a special appreciation for two cultures and two sets of traditions that blend into one. What defines me as a journalist is my quest to seek the truth, question authority, denounce injustice and uncover corruption. I'm in the business of reporting the news not making news. However I feel the need to talk about an incident that addresses both the importance of having pride in our cultural heritage and accuracy in reporting. 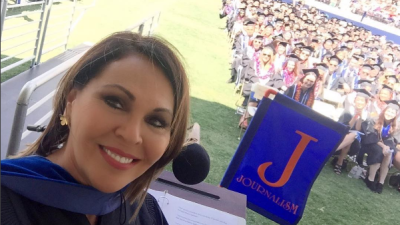 When I was invited by Cal State Fullerton to give the commencement speech to the 2016 graduating class and receive an Honorary Doctorate of Humane Letters I was thrilled. I was so honored to go back to the state where I was born, where I have my childhood memories and where I began my career in Spanish language television. What made it all the more special is that Cal State Fullerton is number one in graduating Latino students in the state of California, number five in the country. As a member of the Board of Directors of the Hispanic Scholarship Fund and providing my own scholarship for the last two decades through the National Association of Hispanic Journalists, it was a proud moment to see that more than 30% of the graduates were Hispanic, and over 40% of those students were graduating from the school of communication. I shared my personal story with the students and gave them words of advice. I spoke to them about some of the challenges they might face. I reminded them that they are the leaders of tomorrow and how I am inspired by what an amazing generation they are. I wanted them to feel empowered and leave there believing that they can conquer the world. I took a minute in my speech to address the parents of the Latino students in Spanish, to congratulate them and tell them how their sacrifices were paying off. I was asked by the University if I could also spend a couple of minutes addressing the school of communications after the main commencement address. Having had the honor just a few weeks before to be the commencement speaker at American University's School of Communication in Washington, D.C. and receiving many messages from students who felt moved and inspired by my words I wanted to have the same positive impact on Cal State students. I told them they are the ones who will be re-inventing media. I spoke to them about what motivated me to go into the news business. And I warned them against using news coverage of the current election as an example of what "fair and balanced" journalism should be. Now, what I said after that set off a slew of reactions that frankly have me a bit bewildered. During my remarks I heard some yelling coming from the bleachers where the families were seated but couldn't make out what they said. I continued giving my assessment of how the media is treated like “Public Enemy No. 1” every four years during election time. I said “they accuse us of misinterpreting what candidates said, but thanks to technology now we can prove that they said what he or she claim they didn't say. Now we are even being accused of creating Donald Trump, imagine that". Before closing I took a moment again to congratulate, in Spanish, those students who recently began to put together a Spanish language newscast at the school. I took a selfie with them and said good bye. Later on that day I saw a message on my Twitter feed from student Denise De La Cruz, a graduate who reports for OC Weekly, who thanked me for my "bold speech" and asked what I thought about backlash from audience members. I never considered my speech to be "bold" and had no clue there had been a "backlash." Needless to say I was perplexed when I began to see my social media light up in a battlefield between attackers and defenders of my so-called backlash all coming from an article De La Cruz wrote with a catchy headline stating that I was booed at Grad Speech and spoke of "racial tension," that frankly I did not perceive. I was even more surprised when the reporter said my speech was too Latino-centric and "blatantly anti-Trump", and when she claims that I began offering advice to journalism students to "use the tools of media to rebut political figures such as Donald Trump." Interesting. My inquisitive mind made me reach out to her on Twitter and tell her through direct message how I think it’s good bold journalism to write about what you saw. But where did she get that I was bashing Trump? She explained that because she was writing in first person perspective, what she provided was "her interpretation." She adds: "I understand that from now on and depending on what style of writing a story holds, I should be more careful with my interpretation and the facts." Not a bad idea. De la Cruz argues that me saying the media is blamed for creating Trump, holds anti-Trump sentiments. So, where did she get the part that I was "recommending students to use the tools of the media to rebut candidates like Trump?" De la Cruz's answer to me reads like this: "I believe I got that from the sentence about how we use technology to report what candidates really said, which then could imply using the tools of media/technology to rebut candidates such as Trump." In other words, she did not report what I said, but what she thought I was implying. What people read is her interpretation of what I said. De La Cruz and her editor are very excited that her story made national headlines with such prestigious publications as the Washington Post, The Hill, LatinoUSA, The Los Angeles Times and La Opinion, to name a few. I'm sure she'll have a great future in the business. But do we see a lesson here in accurate reporting? Should journalists skip the facts and just provide their personal interpretation of what happened, regardless of the consequences? Granted there is nothing wrong with reporting on how my comments were perceived, but do we just completely erase the already blurred lines between opinion and factual reporting? I don't think that's what I meant when I said young journalists are going to re-invent the news business. By the way, this is a perfect example of how new age technology, through the smartphone lense, can be used to show what was actually said. I hope somebody got that message. To those who felt uncomfortable with me pronouncing a few lines in Spanish, I meant no disrespect. Hispanics are now a majority in California, with almost 15 million Latinos living there, and Spanish is the state’s second most spoken language. In my 35 years as a broadcast journalist I know first-hand the struggles of Hispanic immigrant families to make sure their children receive a college education. In many cases they are the 1st ones in their family to receive that diploma. It is a moment of pride like no other to see them graduate. I must admit it is a bit disappointing to see the reaction my words caused both among some of the students at the graduation and the hundreds of people that took to social media with a fierce vengeance to comment on something they didn't witness and were ill informed about. The strength of our country lies in its diversity. It is wonderful that immigrant families from all over the world embrace their cultural heritage with all its sounds, scents and flavors. Celebrating St. Patrick's Day, Chinese New Year, Rosh Hashanah, Oktoberfest, Kwanzaa, Cinco de Mayo and many others along with Thanksgiving and Fourth of July, that's what makes America a great country, that is what makes America the great country that it is. Something that Denise De La Cruz and I have in common is that we are both Latinas that are proud of our cultural heritage. "Mi papá loved your speech by the way," she told me. "It was nice for him to be addressed in his language." De nada Denise.